Jesus, I have a question for you. How many times should I forgive someone when he sins against me? Up to seven times? There once was a king who wanted to collect all the money that his servants owed to him. I want to settle all of my accounts. Bring me the servants who owe me money. Yes, my lord, you have sent for me? Yes, I see that you owe me millions of dollars. I am settling my accounts today, so you will pay me what you owe me. Now. But...but...but...I don't have millions of dollars to pay you back. I can't pay you today. I don't have enough money. Well, then, I order that you, your wife, your children, and everything that you do own be sold to pay me what you owe me. Next. Please, sire, please give me time. I'll pay everything back. I promise. All right, I will forgive you all of the millions of dollars that you owe me. You no longer owe me any money. You are free to go. Thank you so much, my king. Thank you! Soon, this servant who did not have to repay his debt to the king, met a man who owed him money. Yes, what do you want with me? You owe me a few dollars. Pay me back now! 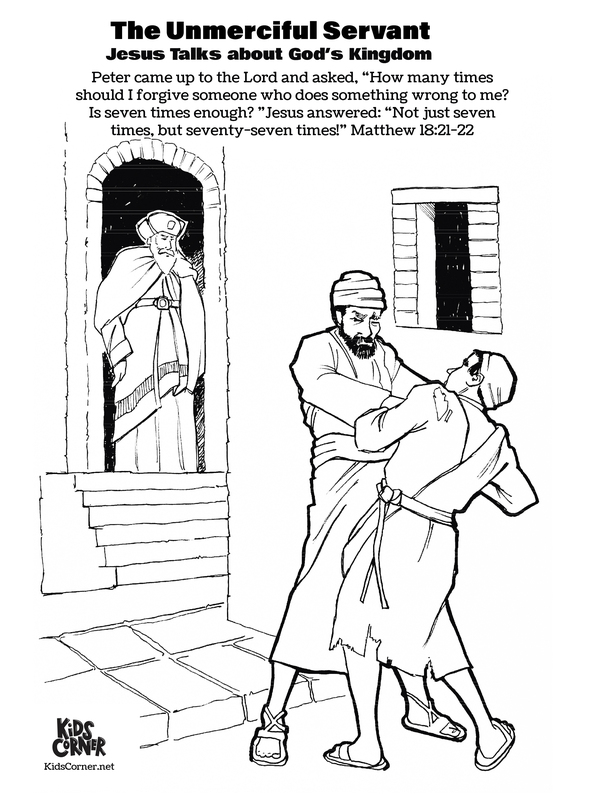 Then the king's servant grabbed the man who owed him just a few dollars and began to choke him. Please, just give me some time. I will pay you back the few dollars that I owe you. I promise you that I will pay you your money. No, that is not good enough. I want my money today. I will have you thrown into prison until you pay me. Several other servants saw what happened, and they were very troubled. In fact, they went to the king and told him what his servant had done. Call my servant back. I will speak with him immediately. Yes, my king, what may I do for you? You evil servant. I forgave all that you owed me because you begged me to. Shouldn't you have had mercy on the other man just as I had mercy on you. Now you will go to prison. You will be punished until you have paid back everything you owe. I tell you, Peter, that this is how God in heaven will treat each one of you unless you forgive other people from the heart. God has forgiven you. You must also forgive others. If you want to read more stories that Jesus told about the kingdom of God, read the book of Matthew in the New Testament of your Bible.